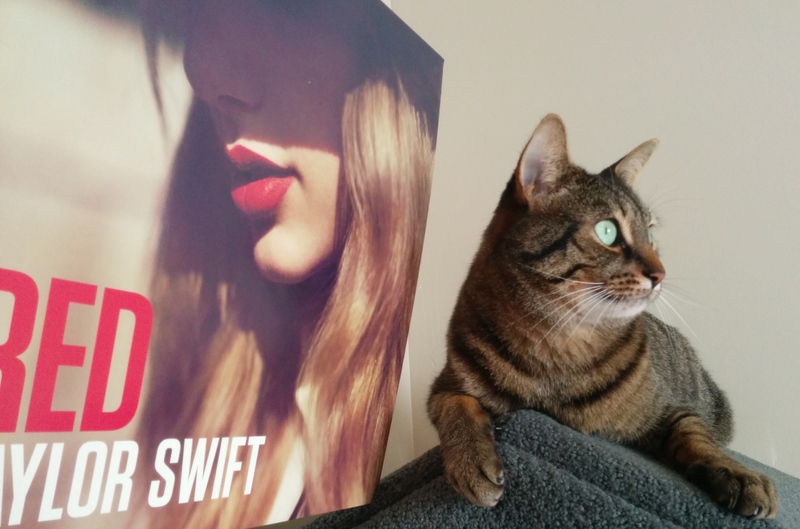 It’s no secret that Virtute and I share a mutual love for Taylor Swift. On many evenings after a long day of writing (or in Virtute’s case shifting around the house looking for the sunniest spot to sleep), we often enjoy letting loose to the epic Taylor Swift album, Red. I dance around the house and he usually chases the “Virtute limited edition one inch mylar crinkle ball“. At the time, Virtute had described the album as “A deep rumination on the fickleness of relationships, a gruelling grappling with the pressures of normative gender constructions, and the small beauties of new loves.” So, as you could imagine we were both anxiously anticipating the release of Taylor Swift’s 1989. Upon a first listen, I was devastated. The album seemed to strip the personal and thoughtful work that T.Swift puts into crafting her lyrically driven music for a bubble-gum pop that was lacking in substance. The release of the video for “shake it off” seemed to confirm my fears. So after a few weeks I had to ask Virtute his assessment. As usual, he surprised me with his take: “The album on many levels is indeed a move away from the personal, but that doesn’t mean that it is without merit and upon deep reflection we come to understand the new paradoxes gripping Taylor’s life. It seems as though we spend too much time policing the decisions of young women in music as in life. While it is evident that Taylor Swift has always been a mainstream pop artist, it at least appears as though she is having fun with the writing process and sometimes we should be open to experimentation and play in music. Even Kendrick Lamar thinks so. ” I’ve heard this line of argument from Virtute before, so I wanted to push him by asking what if the manipulation was not in our interpretation of her work but in the way the industry pushes for a vapid and thoughtless array of music that sounds the same. And so we have made plans to purchase the 1989 LP when it is released on December 9th and we’ll be developing our defence further. Virtute’s loyalty is often unparalleled.